This Beluga Lentil Kale Beet Stew with apple is just what you need to warm up on a crisp Autumn day. It’s warming, inviting and comforting. It’s comfort food at its best. Fall is the season for slowing down. Even in the kitchen it’s important to slow things down. In the Fall our bodies require more warming foods as the temperature drops. 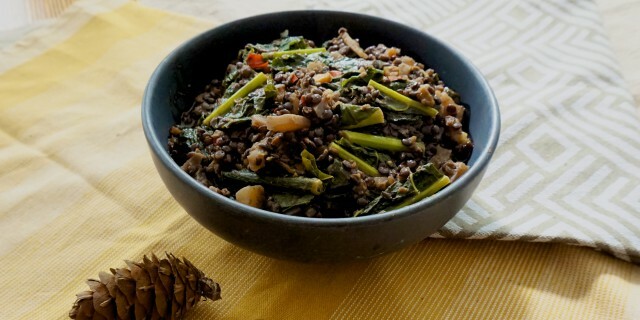 This Beluga Lentil Kale Beet Stew has a warming effect and grounding effect on our bodies. Lentils and root vegetables like carrot, shallots and beets can help us to restore balance. Hearty, heavy liquid stews are not only the perfect way to cook Fall vegetables but the cooking method itself helps us to firmly plant our feet on the ground. When we transition from summer into fall, we can sometimes feel a little ungrounded or even feel sluggish. The days are becoming shorter and cooler and we are getting less sunlight. This stew is just what you need when you are feeling sluggish, stressed out or scattered all over the place. This Beluga Lentil Kale Beet Stew nourishes and invigorates you. It’s Fall on your plate! Even the lovely colours of this dish remind you of an Autumn day: mossy green, vibrant orange, bright red, warm brown and golden yellow. It even tastes like Fall with sweet apple and carrot, earthy and peppery kale, sweet, earthy yellow beets and warming, wintery spices like cinnamon and cardamom. I used Ras-el-Hanout in this stew. It’s spicy and warming and reminds me of Christmas dinners. Ras-el-Hanout is a complex, aromatic Moroccan spice blend, with cardamom, coriander, cloves, nutmeg, cinnamon, black pepper, mace, ginger and turmeric. It’s the perfect spice blend for braises and stews as the flavour keeps developing during the slow-cooking process and the beautiful aromas fill up your whole home. Invite Fall into your own home with this warming and nourishing Beluga Lentil Kale Beet Stew! Heat olive oil in a pan and cook the shallot, carrot, garlic and chili for 3-4 minutes or until soft. Add the Ras-al-hanout and cook for 1-2 more minutes or until fragrant. Add the lentils and cook for 1-2 more minutes. Add the stock and yellow beet. Bring up to a boil, reduce heat and allow to simmer for 15 minutes or until the lentils are just tender. Season with black pepper and sea salt. Add more water if necessary. Add the apple and chopped kale leaves, and cook for 5 more minutes. Remove from heat and add apple cider vinegar. Mix well and let is stand for 10 more minutes before serving.